is a noted comic book artist, illustrator and painter-- his work has been published all over the world and exhibited in galleries as far away as Sydney Australia. One of his paintings is in the collection of the National Gallery in Washington DC. Andy studied with Will Eisner, Jack Kirby and Paul Ryan as he learned the craft of comics and graphic novels. He's kind of a big deal, at least according to his mom and she doesn't even know he's on Wikipedia. Andy's work has been exhibited in galleries all over the world and one of his paintings is in the permanent collection of the National Gallery in Washington DC. Participant - Andy is always interested in new gallery opportunities. Judge- Andy has extensive experience in juried shows. Consultant - Andy can use his experience to help you establish a new gallery space, or to prepare your own work for display. 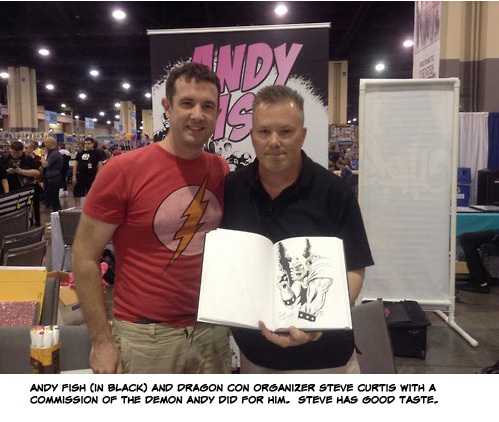 COMIC BOOKS & GRAPHIC NOVELS Andy is an experienced and published creator. SKETCHES & COMMISSIONS - order a one of a kind illustration in ink, or a fully rendered painting either digital or in watercolor or goauche. Cover Work - Make your book stand out with an original art or uniquely designed cover. $50- $3K - Each commission has it's own ins and outs. Contact andy@andytfish.com to discuss your project. Providence, RI - Post grad studies in illustration and painting. Emerson College Faculty Graphic Novel Studies and production. Japan - Andy travels frequently to Japan, While there he studies the ways of Manga artists and comic art culture from the other side of the world. Andy can lecture on art, art history, working as a freelancer, travels in Japan, establishing yourself as a writer or artist and many other subjects. His talks are lively and popular. JUL 2018 - Andy is working on BLACKWOOD with his wife Veronica and writer Evan Dorkin. Andy and Veronica are handling all of the art, coloring and lettering for the book which is being published by Dark Horse Comics. In 2017 Andy launched BATMAN THE SINISTER SIDESHOW OF DR SCORPIO which runs as an internet strip and is updated once a month. He is also continuing work on SINISTRE for an independent publisher and is developing his next graphic novel set during the dust bowl called RAIN. Previously Andy completed the online pulp inspired Batman comic strip THE DEATH RAY OF HUGO STRANGE to much acclaim. 13th Dimension called it "The Best Batman Comic DC Never Published" which is kind of praise for it I guess. Andy holds the record for consecutive years as an artist mentor for ART ALL STATE after participating with them for a decade before hanging up his brush. Andy was a popular instructor at the Worcester Art Museum from 1999 to 2014 when he left due to a disagreement over the direction of the institutions art classes for serious high school students. Andy is the author of five HOW TO DRAW art books for Chartwell Publishing in London. Andy is previously a professor of Graphic Novel Studies for Emerson College in Boston. Latest print book; GEEKS AND GREEKS with the hilarious and brilliant Steve Altes which went to print in late summer 2016. That's Entertainment recently published INSECT MAN'S 25th ANNIVERSARY EDITION which was Andy's first professional work back when he was only 17 years old. Boys and Girls Club Lifetime Achievement Honors, New England Newspaper Illustrator of the Year, Inkpot Award, Contender for an Eisner Award and someday Rondo Winner. Paintings have been in galleries all over the world including one in the collection of the National Gallery in Washington DC. Over two dozen books in print by several publishers world wide. Graphic novel illustration, comic book art, storyboards for film and TV motivational speaking for artists and workshops for all ages. He can also write and have several screenplays and script doctoring credits. His specialty is dialogue so give him a crack at your script and he can punch it up.